SXSW triumphs over tragic events which threaten to derail the entire festival, Getintothis’ John Siddle reflects on the outstanding performances from Texas. Suddenly, among the cacophony and chaos, silence fell across Austin. Tens of thousands stood still as the music fell to a solemn hush across a festival marred by the tragedy of the previous evening. In that two-minute reflection, it was hard not to think ‘what if?’. Getintothis was only two blocks away when an alleged drunk driver smashed through barricades on one of the city’s busiest streets, hitting and killing three people and leaving 22 others injured. Police say Rashad Owens, 22, “intentionally accelerated” into the crowd after cops tried to stop him on suspicion of driving a stolen car and showed no attempts to brake. The victims were outside the Mohawk, one of South by Southwest’s seminal venues, waiting in line to see hip-hop sensation Tyler the Creator when horror struck. The following day, as grief and shock pervaded a city where love and laughter usually breathe down like the warmth of the sun, watching live music and getting drunk seemed shallow. Irrelevant. Critics were already accusing SXSW of being out of control; some accusing this 27-year festival of abandoning its principles as an industry showcase for up-and-coming bands by allowing corporate giants to stage sponsored shows with big-name acts – take Lady Gaga playing a Doritos-promoted show, or Samsung hosting Kayne. Yes, SXSW, officially a music industry conference, has changed in the four times we’ve been out there – both for better and for worse – but there is still nothing like it. It is the random, frenetic nature of this festival that makes it what it is. Every year, thousands of acts apply to perform at SXSW’s official showcases, held over four nights in the Texan capital. But everywhere you roam, there are hundreds of bands playing fringe shows in bars, parking lots, patios – even on the street. The festival is the inspiration for Merseyside’s very own embryonic version; Liverpool Sound City. And in those two minutes of silence to mark the previous night’s events – for us, held between the melancholy of Turin Brakes and the harmonies of the Magic Numbers (both hampered by awful sound problems) – it dawned on us: the music should play on, louder than before. With more euphoria and celebration. Because that’s its very essence of music – it relieves us, comforts us, inspires us. Music, in all its guises, brings us together and it is that which will always define SXSW, not a lunatic hell-bent on destruction. 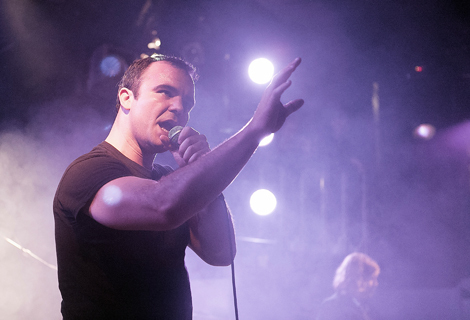 Baltimore lo-fi trio Future Islands, and in particular their frontman Sam Herring, will take many of the plaudits. In fact, as we’re writing this an email dropped from SXSW naming them as the winners of the festival’s Developing Act Award. In downtown’s plush Haven Lounge, Herring has all the hallmarks of a New Romantic crooner, yet busting some eyebrow-raising hip-swivelling moves. 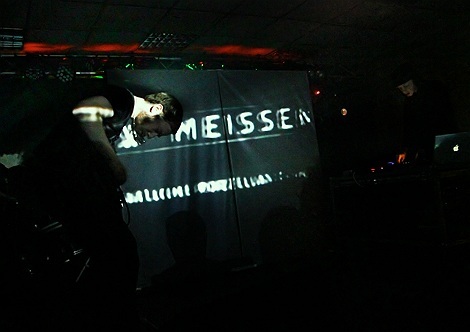 His band’s moody songs are very synth heavy – think OMD with an edge – but it’s all about the frontman. Herring was diving into the crowd, trying to swallow his own fist and growling away in an intense 40-minute showcase of reinvented new wave that had all inside enthralled. Their fourth album Singles, released this week, and its lead track Waiting On You, will see these guys hit the big time. Catch them at the Kazimier in June. Over in Latitude 30, a bar rebranded during SXSW each year as the ‘British Music Embassy’, London funksters Jungle finally became unmasked. Renowned for an apparent determined anonymity (singers named T and J, gigs played behind the thick haze of smoke machines, or with microphone pop-shields masking their faces) the mystery was unravelled. Despite using video stills of black dancers from their videos as the band’s publicity shots, Jungle are in fact pasty, skinny and white. And they make a hell of a sound. Playing as a five-piece, Jungle overcame the scourge of many a SXSW performer (a lousy sound system) to grind out their 1970s groove – with understated hip hop beats, gritty rhythm guitar and soul vocals aplenty. Their tune Busy Earnin’ will be one of the songs of the year. Catch them at Sound City in May. In true SXSW spirit, sometimes the best bands are the ones that hit you by chance. LA-based collective The Mowgli’s – the apostrophe confuses me, too – are West Coast sunshine pop at its best. Okay, the lyrics are a bit flimsy ‘Love is simple. Love is easy‘, or ‘I’ve been in love with love and the idea of something binding us together, you know that love is strong enough,’ but, by God, it is catchy. Obviously raised on a fastidious West Coast diet of the Byrds and Beach Boys, there’s is a perfect sound for a warm Austin day and $5 tepid Texan beer. San Fermin are playing Sound City too, and are a must see. Barely a year old, the eight-piece New York baroque pop group is the brainchild of 24-year-old composer Ellis Ludwig-Leone. Their sound switches from classical to pop in constant and stirring soundscape. It’s intense euphoric in a kind of Beirut/Arcade Fire way. Their hit Sonsick is one of the best songs I’ve heard this year. Merseyside was also playing its part in Austin. Toxteth rising star and GIT Award 2013 nominee, Jetta, who started out singing backing vocals for Paloma Faith and Cee Lo Green, closed the British Music showcase with a simmering performance of rock and roll energy and soulful wails. GIT Award 2014 nominee Forest Swords – aka Wirral native Matthew Barnes – had the pleasure of playing the Central Presbyterian Church, where last year Getintothis saw the likes of Milk Carton Kids, Devendra Banhart and Iron and Wine play out quietly captivating shows to attentive crowds – must be something about playing in a church – no-one wants to make much noise. It was the perfect venue for Forest Swords to play out their eerie, exploratory and oft minimalist dub-drone, and received well by the converted throng inside. Other special mentions go out to Berlin-based dreamy pop trio Ballet School, whose show at the aforementioned church sounded like Robert Smith reinvented as Madonna and infectious Boston band Air Traffic Controller who played the most mesmerising version of the Rolling Stones‘ Wild Horses with mandolin and fiddle. Liverpool Sound City can’t come soon enough. GIT Award 2014: Artist nominee profile – Forest Swords. GIT AWARD 2013: Nominee profile – Jetta. 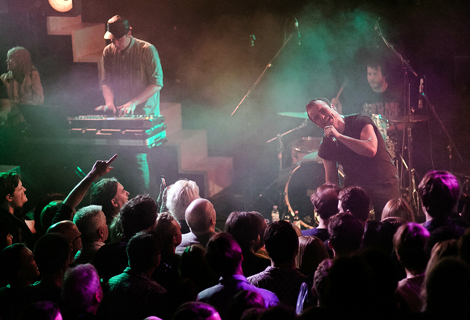 Future Islands set for Kazimier date in June. Liverpool Sound City 2014: Jagwar Ma, Factory Floor, PINS and more set for May festival. Liverpool Sound City 2014: Jon Hopkins, Albert Hammond Jnr, Drenge and more for May festival. * Getintothis flew to Austin on the new, direct British Airways route from Heathrow. Return prices start from £550. Details.